By letting you easily discover and share content on your favorite topics, Scoop.it will help you save time maintaining your social media presence. If you haven't done so as you signed up, simply connect your social profiles and share your curated content to all your social profiles in one click as you publish it. To get started, make sure to first connect your social media accounts to Scoop.it. To do so, go to your Settings and then Sharing Options. 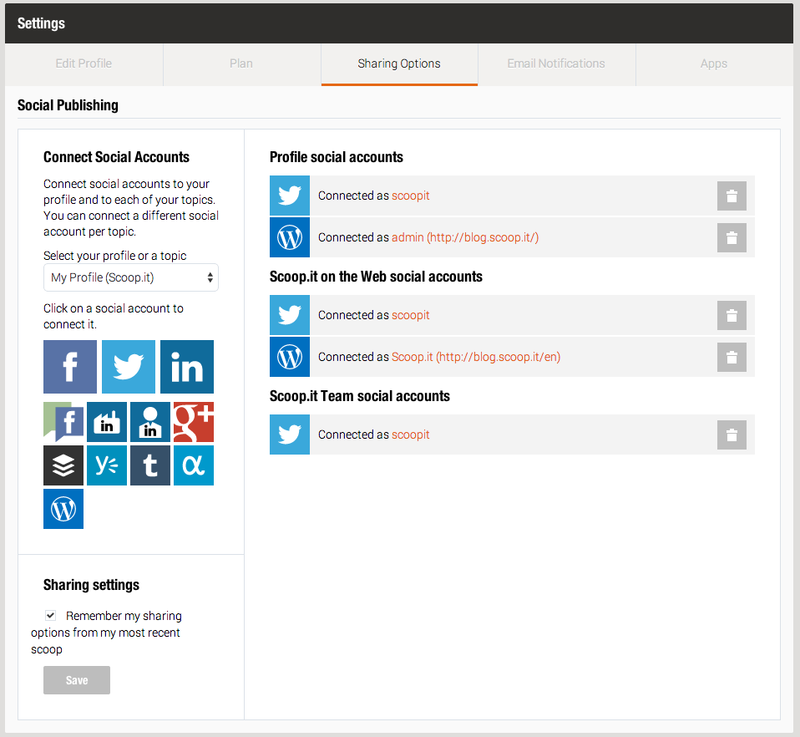 Here, you’ll be able to connect one of the available social networks with Scoop.it Free, and additional profiles with Scoop.it Pro and Plus. 2. Publish once, share everywhere. Once you’ve connected your accounts, you will have the option to share all of your Scoop.it posts to your social media channels by checking the associated box in the publishing window. By default, your newly connected social accounts will be checked and Scoop.it will remember which ones you had checked last time you published on that topic. Of course, you are always free to check/uncheck the sharing destinations for any scoop you publish. By hitting publish from the Scoop.it publishing window, your content will be shared on Facebook, Twitter, LinkedIn or any destination you have chosen to share to. The above publishing window also lets you customize the content of your tweet, Facebook, LinkedIn or Google+ update so you can taylor the message to your audience on your various properties. By default, the link included in your social post will direct your audience to your own content hub on Scoop.it: each scoop you publish on your Scoop.it topic has its own permalink which enables your readers to (1) discover your added insights to the original post (and make them want to read it with your own context in mind) (2) discover related content from your topic page. But the Scoop.it publishing window also offers the "Direct Link" option that enables you to send your social media audience directly to the original content if you wish to do so. To do this, simply toggle the DirectLink button in the Share section of the publishing window on a post by post basis (the system will remember your last choice and use it by default). By going to your Scoop.it suggestions and followed topics regularly, you will find relevant content to engage your social media audience in no time. 5. What social networks and profiles can I connect to Scoop.it? 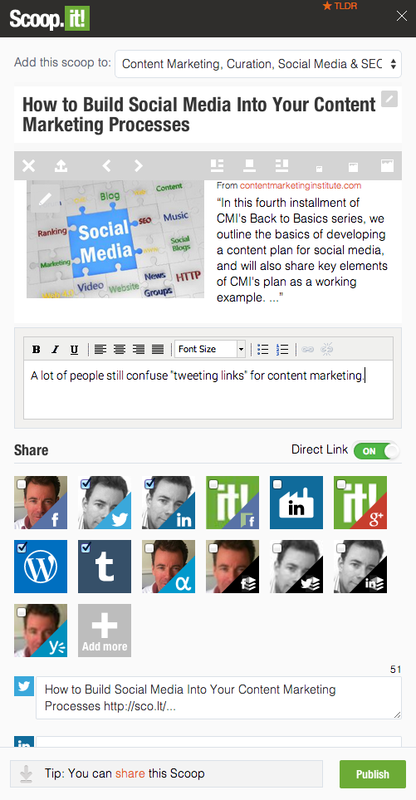 Scoop.it also integrates with website platforms / CMS such as Wordpress, HubSpot or Drupal. More details here. Rights needed to connect Facebook pages, LinkedIn company pages or Google+ pages? You can only connect pages on Facebook, LinkedIn or Google+ that you have administration rights for. As you attempt to connect your page to Scoop.it, make sure that you’re logged in as an admin on your Facebook page. For example, if your personal Facebook email is DogLover22@gmail.com but you manage a Facebook page logged in with the email CatLover21@gmail.com, make sure you’re logged in as CatLover21@gmail.com otherwise you will get an error message when attempting to connect your Facebook page. 6. Can I share to Google+ profiles or StumbleUpon? Google+ profiles and StumbleUpon are currently not supported as a direct connexion but you can still use Scoop.it to share to these platforms curated content from your topic pages. The process just requires a few extra steps. In order to share to Google+ profiles or SumbleUpon, you must first publish your post, and then revisit it. When you scroll over the published post, a share button will appear and you can click on the arrow. There, you will find the SU and +1 Google+ buttons. The reason the inability to connect your accounts directly is related to the APIs of these networks. How can I integrate a Scoop.it topic to my Wordpress website? What is a Scoop.it topic page and how can I use as a content hub? Comment trouver et suivre des topics en relation avec mon domaine d'activité?